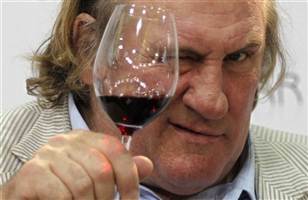 One of France’s biggest film stars, Gerard Depardieu reportedly urinated in front of fellow passengers on an airplane, after cabin crew refused him access to the toilet on Tuesday. The 62-year-old actor was traveling on a flight from Paris to Dublin on Tuesday evening when the incident occurred, after the scheduled flight had been delayed. Speaking to French radio station Europe 1 on Wednesday morning, a fellow passenger identified as Danielle, said the actor relieved himself on the carpet, after flight attendants told him he couldn’t use the restroom until after takeoff. "Je veux pisser, je veux pisser," ( I need to piss, I need to piss) implored Depardieu, according to the passenger, who was among the 127 passengers on board the Air France jet, operated by City Jet. The actor said he could not wait, unzipped his trousers and proceeded to urinate on the carpet. "You could tell he'd been drinking," the passenger added. The Dublin bound flight was forced to return to the gate and delayed for a further two hours. Air France confirmed the incident had taken place in statement to a national French TV station TF1. A celebrated French actor, Depardieu won a Golden Globe for his performance in “Green Card”. He has appeared in more than 150 films and also owns a restaurant and vineyard in France.